Update: Just in time for Senators John McCain and Lindsey Graham's arrival in Egypt, the Egyptian army and interim government are offering the Muslim Brotherhood a compromise. In an attempt to end the country's political crisis, the government will offer to free a number of Muslim Brotherhood members from jail, unfreeze the group's assets, and grant it three ministerial posts, according to a senior military source. Plus, Egyptians can now insult the president without fear of getting locked up. 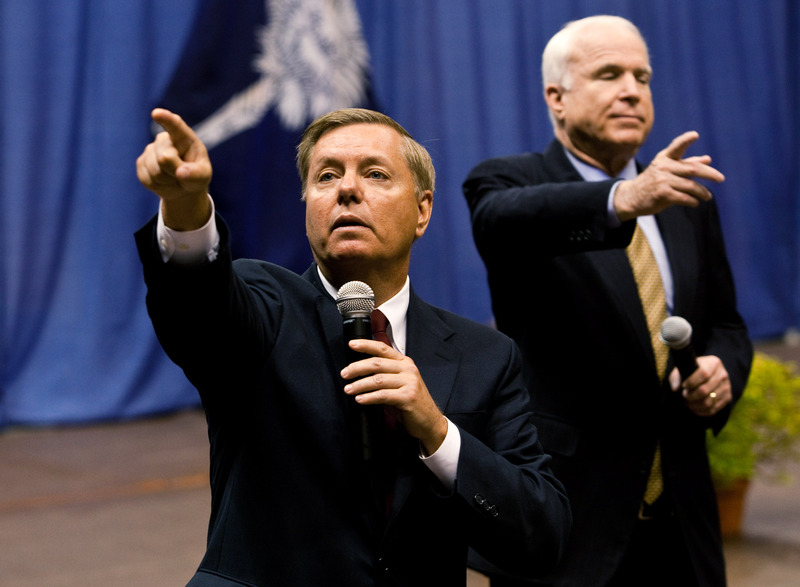 Senators John McCain (R-AZ) and Lindsey Graham (R-SC) arrived in Cairo Monday for two days of negotiations, joining other U.S. and EU envoys who have been meeting with officials from the military-backed government as well as supporters of toppled President Mohammed Morsi. Their arrival coincides with multiple efforts to break up the two mass sit-ins led by Morsi supporters in Cairo. Egyptian Army chief Abdel Fatah El Sisi met overnight with leaders from different Islamist movements — though, notably, not the Muslim Brotherhood — to try to resolve the crisis, underlining that opportunities for a peaceful solution exist if all sides reject violence. However, the military-backed interim government has been responsible for the deaths of more than 100 Morsi supporters since the former president's July 3 ousting. A government helicopter also dropped leaflets over Morsi supporters in the Rabaa al-Adawiya square, urging them to leave. The pamphlets promised protestors they would face no action if they had not committed a crime while protesting. The ultimate goal of the peace talks is to return power in the country to politicians from the military rulers who are in control right now — and do so through means that prevent further violence and bloodshed. McCain and Graham join U.S. deputy secretary of state William Burns who conducted separate talks with Egyptian Foreign Minister Nabil Fahmy and members of the Muslim Brotherhood over the weekend. Because who better to fix a complex political problem in a foreign country than everyone's favorite Congressional tag team?